Background: The back of the skull, known as the occiput, often differs in shape from the other skull bony surfaces. Due to the attachments of the thick neck muscles, the inferior surface of the occiput can have bony ‘irregularities’. Such raised bony areas are a result of the ‘form follows function’ anatomic principle where the pull of the muscles creates specific raised bony areas. Such raised bony areas are all well known and are the inion (occipital knob) and various horizontal nuchal lines. Usually such bony prominences are minimal and are not visually seen due to being small in size and covered by the muscle/fascia. But they can come more prominent in men presumably due to thicker neck muscles and the influence of testosterone. I presume this effect since I have only seen men with these occipital prominences and not women. Besides their higher anatomic occurrence in men they also can become an aesthetic concern due to their exposure. Men far more frequently have shorter hairstyles or shaved heads, making every skull surface more exposed. 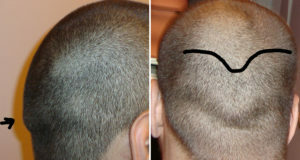 The combination of a prominent occipital knob and raised nuchal lines created a visible ridge on the back of the head that looks like a ‘gull wing’ shape. For those men so affected it can make them wear long hair than they desire and ultimately seek surgery for correction. Under general anesthesia and in the prone position. a limited horizontal skin incision was made in a scalp skin crease just below the occipital knob. Dissecting done through the thick scalp tissue exposed the bony knob. This was reduced by burring for a 10mm reduction, turning the bony shape inward for a convex shape to the bottom of the central occipital skull. From there the raised nuchal line was bred down as far as could be reached within the limits of the 5 cm skin incision. The occipital gull wing skull deformity is the result of raised bony prominences along the bottom of the skull. The successful reduction of its entire length is done by bone burring whose only limits is how far to the sides one can go based on the length of the permitted skin incision. 1) The gull wing occipital skull deformity is a combination of a prominent occipital knob and bilateral raised nuchal lines. 3) The raised bony nuchal lines are reduced as far to the side as possible within the limits of the length of the scalp skin incision.